The Ping i25 hybrid features a compact, 17-4 stainless steel head with a forward-hosel design that produces a high launch with optimal spin rates. 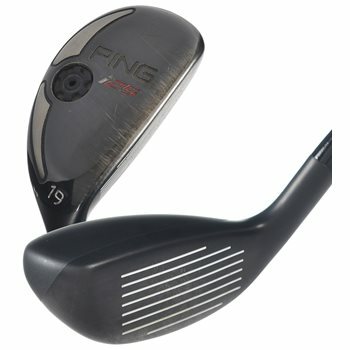 Its flatter bulge-and-roll face design enhances shot-shaping capabilities while its straighter leading edge and squared toe promotes accurate alignment. The compact design and the shorter heel-to-toe length of the i25 improves turf interaction resulting in solid contact from most any lie on the course. The progressive center of gravity location has the CG lower and deeper in the lower lofted hybrids and progressively moves more forward as the lofts get higher to optimize trajectory and distance regardless of loft for ball flight consistancy.